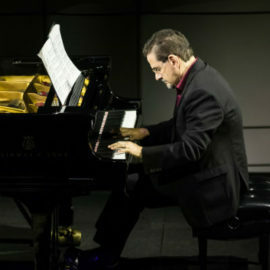 Celebrating the lyricism of the stage, the flair of the jazz club, and the rigor of the conservatory, which all come together in the scintillating work of a Copland House favorite, the versatile JOHN MUSTO. Includes the World Premiere of a new chamber work (a Copland House commission), his Piano Trio, and his own 2-piano versions of beloved works by Bach and Mozart. the place to discover tomorrow’s masters today, features the World Premieres of six brand-new works created especially for Copland House’s coveted annual emerging composers’ institute by this year’s rising-star Composer Fellows: FLANNERY CUNNINGHAM, CHELSEA KOMSCHLIES, CHARLES PECK, IGOR SANTOS, NINA SHEKHAR, and SAM YULSMAN. 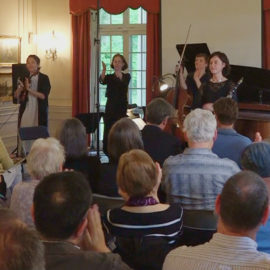 This concert is the culmination of an intensive, weeklong, all-scholarship creative workshop and mentoring program that has become one of Copland House’s flagship initiatives for championing gifted young American composers.